I've written a Gospel tract specifically for members of occult religions, using Microsoft Publisher 2000. You can download the .pub file HERE if you'd like to have it. It's 6 MB because of all the photos. You can view the actual tract here. You must have Microsoft Publisher 2000, or more recent, to open this file—then you can print it to distribute. You may also want to write your own tracts. Below is exactly what the tract looks like, front and back. It prints on standard size paper. People love pictures, and these images speak volumes against these false religions. This is the truth, however creepy and disturbing. This tract is not for the average person, but for members of occult false religions specifically. They have been indoctrinated and need to have their eyes opened to the truth. This is the truth! I believe that the best way to deal with a member of any religion is to give them the plain and simple Gospel. You win a Mormon to the Lord the same exact way that you lead a Jehovah's Witness (JW) to the Lord, and that is, by grace through faith in Jesus Christ (Ephesians 2:8-9). Albeit, it is next to impossible to get a Jehovah's Witness to admit they are lost. The JW religion deliberately indoctrinates their members with human reasoning in such a way that the Bible is virtually rendered useless (Mark 7:13). Showing the Gospel to a JW is a waste of time in most cases because they are indoctrinated by Satan. 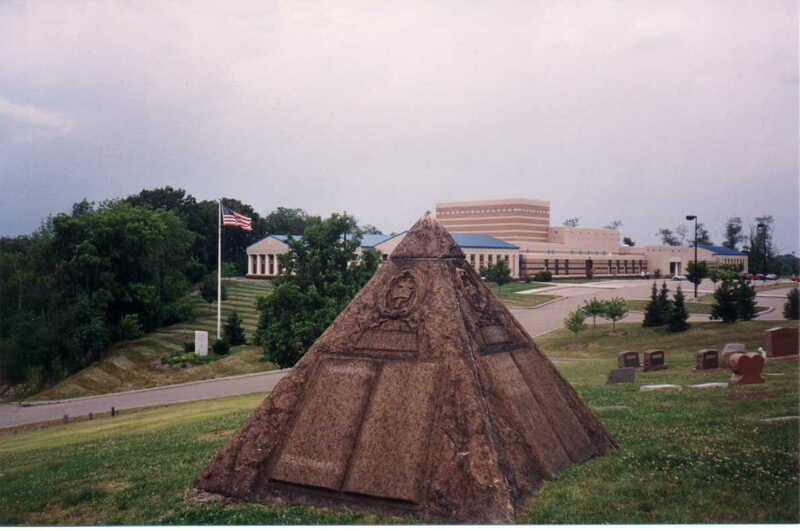 The best thing you can show a Jehovah's Witness is the giant New World Order pyramid parked on top of Charles Taze Russell's grave stone (see photos below) and remind them why Russell rewrote the Bible and called it the NEW WORLD TRANSLATION. Russell founded the JW's in 1874. Challenge them to do a study concerning religion and the occult. They need to know the truth. Also, Russell was a 33rd degree occult Freemason, which is easily verifiable. So was Joseph Smith who founded the Mormons, and Ron Hubbard who founded Scientology. Wicked Freemasonry is the common denominator. There never was a more vile, evil and hideous organization than the Freemasons, an organization within an organization. The hardest part about getting a person saved is first convincing them that they are lost. That's right, lost. Proverb 26:12, “Seest thou a man wise in his own conceit? there is more hope of a fool than of him.” A fool who knows he is lost is just a step away from salvation; but the conceited religious man who thinks his false religion can save him is two steps away from being saved. First, he must admit that he is lost. Second, he must trust the Savior to be saved. Religion blinds men to the truth, thus taking them farther away from salvation, convincing them that religion can save them. What if I were to tell you my friend, that most of the religious people in this world were being misled? What if I were to tell you, that there is a vast Satanic conspiracy to deceive the masses of every society on earth? What if I were to tell you that the top leaders of the world’s religions were in league with the Devil? Would you think I’m crazy? I would! Yet, the truth is stranger than fiction! “For the time will come when they will not endure sound doctrine; but after their own lusts shall they heap to themselves teachers, having itching ears.”All we see on TV are televangelists begging for more money, telling people what they want to hear—promises of health, wealth, and prosperity; BUT, they never preach against sin, and never tell people that trusting in good works for salvation is a road straight to Hell. Well, I’m going to share with you the truth of God’s Word because I care about you. Let me state right from the start, that salvation is not found in ANY religion; BUT, only in a Person—The Lord Jesus Christ. No amount of good works can take a person to Heaven. Only through the precious blood of Jesus Christ can a person have their sins forgiven, and be saved eternally (1st Peter 1:18,19). “But to him that worketh not, but believeth on him that justifieth the ungodly, his faith is counted for righteousness.”The Biblical Gospel excludes ALL self-righteousness! We see the occult everywhere nowadays. 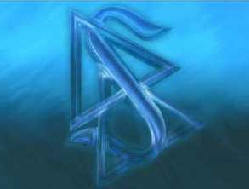 The most common symbols are the illuminati pyramid and the all-seeing eye of Horus. You see friend, 2nd Corinthians 4:4 reveals that Satan is the god of this world’s wickedness. Satan controls the world through occult (secret) organizations, who’s members are devout followers of Satan. “Illuminati” is a term used to refer to the occult-inspired leaders of this world. Hitler was infatuated with the occult, as were many of histories top leaders. 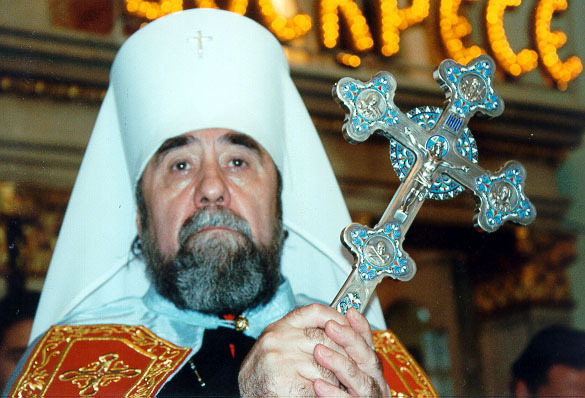 Above : A Catholic priest holds an occult cross, carefully notice the Skull and Bones emblem. 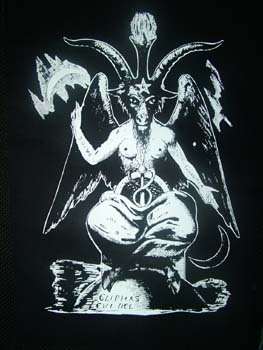 One of the biggest occult groups is Freemasonry, who’s false god is Baphomet, pictured to the right. Few people know that Charles Taze Russell (founder of the Jehovah’s Witnesses), and Joseph Smith (founder of Mormonism) were BOTH 33rd degree Freemasons. I was watching EWTN (the Catholic’s Eternal Word Television Network) the other day. It was their morning mass between 8 to 9A.M. daily. Lo and behold, the priest was walking around with a golden monstrance (shaped like an illuminati pyramid) for everyone to see. This is no coincidence. The photo to the left is the official symbol of the Masonic lodge. Notice the illuminati pyramid at the top, and the occult handshake beneath. Also, notice the eye of Horus within the pyramid. This is pure Satanism folks! Keep reading, you may lose some sleep tonight. 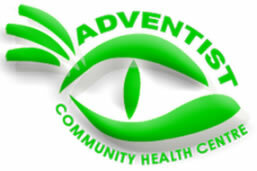 Take a look at the occult illuminati eye in the photo below. Above: A Mormon apron as seen on A&E TV, inside the Salt Lake City Temple. This apron is located in the Mormon temple in Salt Lake City. 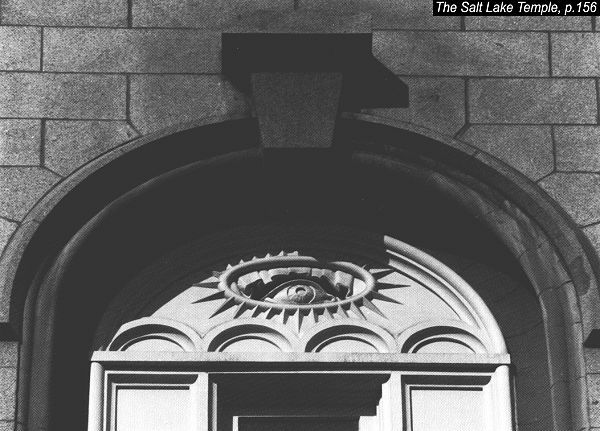 Below is the front entrance to the same Mormon temple. 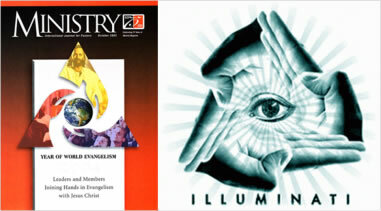 Notice the same Masonic handshake (as seen above) within the all-seeing eye. 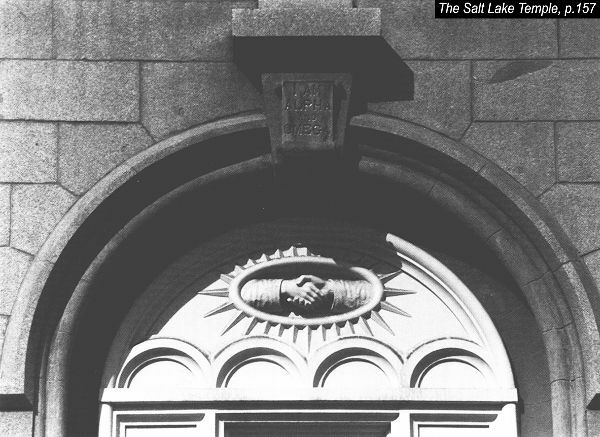 Above: Another entrance to the Salt Lake City, Utah, Mormon Temple. Mormon founder, Joseph Smith, was a 33rd degree Freemason. See, Mormonism and Freemasonry. Notice the illuminati pyramid! This is no joke friend, you have been deceived by the Devil, the father of all liars. Most people in the world today have churchianity without Christianity, and religion without truth. I’m not trying to be unkind; but to warn you about Satan’s works of darkness. Whether it be Mormonism, Catholicism, or the Jehovah’s Witnesses—they’re all in league with Satan! God never started a religion—Jesus simply came to save sinners, asking us to believe upon Him alone to forgive our sins (John 3:16-18). 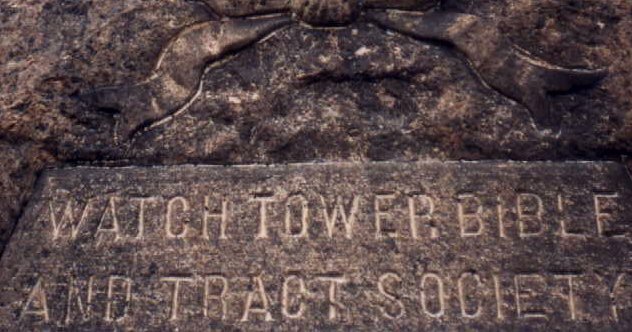 Above: This is the inscription on the same pyramid above, where Jehovah’s Witness’ founder, and occult Mason, Charles T. Russell, is buried. Freaky huh? Above: a close-up of the inscription on the pyramid. 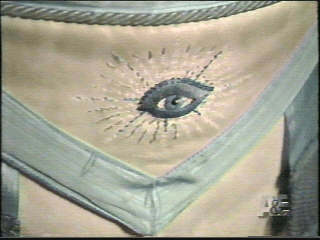 Above is the logo for the Church of Scientology cult. Notice the two illuminati Pyramids! Mary Baker Eddy is the founder of the CHRISTIAN SCIENTIST religion. 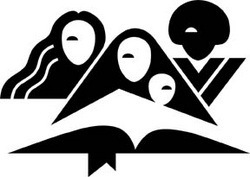 They have reading rooms all across the United States where you can go in, sit down, and be indoctrinated into their religious false cult. 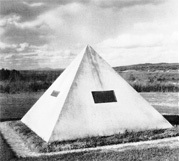 It is more than mere coincidence that the demonic Jehovah's Witnesses gave an Masonic pyramid to place on Eddy's grave, just as Charles Russell (founder of the Jehovah's Witnesses) has a giant illuminati pyramid parked on his grave (as seen above). Freemasons are the visible organization, the work horse to carry out Satan's sinister plot for a Godless Global Totalitarian Communism Police State, aka, a New World Order. Russell even named his perversion of the Bible, the New World Translation. That's about as blatant as you can get. When I witness to a Jehovah's Witnessed, I show them a photo of Russell's grave and the occult connection between the religions. Most Jehovah's Witnesses are victims of the organization, they've been lied to and deceived. We as believers need to expose all these Masonic religions for what they are. 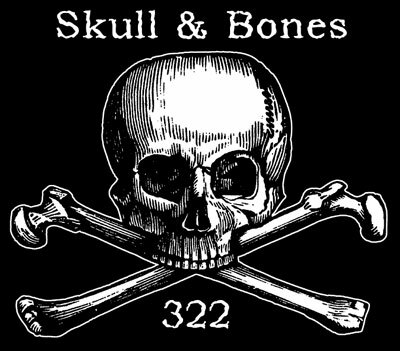 Freemasonry is a diabolic, Satanic, religious cult; they operate in dual fashion, literally operating as two separate entities, an organization within an organization. What is it with all the pyramids and all-seeing eyes? The explanation is simple. Satan uses images, just as “The Great Oz” in the movie, The Wizard of Oz. Satan is the little peon behind the curtain (Isaiah 14:16). The purpose of the IMAGE is to magnify a person, or thing, to give a bigger than life IMAGE. This is why king Nebuchadnezzar had a 90-foot tall, 9-foot wide, statue made of gold for the people to bow and worship, on his behalf. 1921 - On the 100th anniversary of Mary Baker Eddy's birth, an exact replica of the Great Pyramid, made from a single piece of granite and weighing over 100 tons and 11 feet on each side, was carved and placed near the house where Eddy had been born, in New Hampshire. It was a gift from Freemasons. In the "Mary Baker Eddy Letter," December 25, 1997, we learn that when "the Board of Directors noted that too many Christian Scientists were visiting the grand granite marker at Bow ... that marked Mary Baker Eddy's birthplace, they had it destroyed, dynamited to bits!" Eddy's first husband, George Washington Glover, was a Mason, and "thereafter membership in the Masonic Order was the one single 'outside' affiliation that was allowed to church members by Mrs. Eddy." Christian Science and Freemasonry have maintained a symbiotic relationship. Many of the first churches established around the United States had gathered in Masonic Temples. To this day one can find the headquarters for many Christian Science associations having an address corresponding to the local Masonic lodge. SOURCE: Oprah Winfrey, New Thought, "The Secret" and the "New Alchemy"
What you see on the tombstone of the founder of the Watchtower movement is the Knights Templar Symbol for the York Rite of Freemasonry (See below). This degree is equivalent to the 33rd Degree of Freemasonry and is the highest degree of the York Rite indicating that he knew whom he was serving. It was not Jesus Christ of Nazareth to be sure. Who Are Contemporary Christian Music [CCM] Fans Really Worshipping? I preach a lot against CCM singers, because they are deceivers. No one wonders what Marilyn Manson is about. We all know that he rips up Bibles, hates God and is a fool. 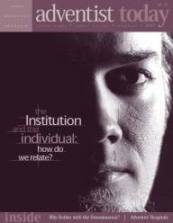 However, sinister ecumenical ministers and apostate so-called Christian singers claim to love God and want to reach people with A MESSAGE of love and unity; BUT the sad truth is that they are leading churchgoers into apostasy, a false Catholic Gospel, and unbiblical unity with unbelievers. ChristianityToday even labels God as a Drama Queen (it is apostasy)! They ought to be honest and call themselves apostates! We all know where Elton John stands; but TobyMac deceives people, and it is sinful to do so. TobyMac claims to be helping his fans through his music; but he is leading them astray, pushing them toward the Catholic religion. Pope Benedict XVI says people can be saved without any Biblical faith. Pope Benedict XVI is a fool. ALL CCM singers accept the Catholic Church and never say a negative word, because many of their fans are Catholic... cha-ching, money, money, money! At least Pink Floyd sings about money and doesn't try to hide anything. God hates a proud look and a lying tongue (Proverb 6:16-19). It is very interesting that king Nebuchadnezzar didn't ask the people to worship him directly; but instead, worship an IMAGE. Nebuchadnezzar wanted to be worshipped, but he knew that he was just a man; so he needed an image 90-feet tall of pure gold to magnify himself through the image. 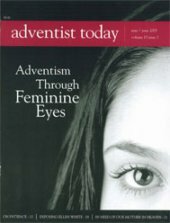 The Antichrist will just be a man; but he will magnify himself through an IMAGE that the Bible says will speak and come to life (Revelation 13:15). Those who refuse to worship the Beast's IMAGE will be killed, just as Nebuchadnezzar proclaimed death to anyone who didn't bow to worship his IMAGE. This is important to understand, showing us why Satan is using the Masonic pyramid and All-seeing Eye to recruit followers to the New World Order. It is for the same purpose as Nebuchadnezzar's IMAGE. So where does Contemporary Christian Music [CCM] come into play? It's for the same purpose as all worldly music today. Daniel 3:5, “That at what time ye hear the sound of the cornet, flute, harp, sackbut, psaltery, dulcimer, and all kinds of musick, ye fall down and worship the golden image that Nebuchadnezzar the king hath set up.” Everyone was instructed to worship Nebuchadnezzar's image when they heard the music, all kinds of music. The Bible lists all sorts of musical instruments. It wasn't about singing or lyrics, but THE MUSIC. Likewise, in these Last Days Satan is conditioning the masses of this world to worship the Beast, and the IMAGE of the Beast, through music. The similarities between Nebuchadnezzar's IMAGE and the Antichrist's IMAGE are more than mere coincidental. Satan's methods haven't changed in thousands of years. George Harrison of The Beatles sang his hit song, MY SWEET LORD. Christian youth all across the world and America were singing along... My Sweet Lord. But then AT THE END of the song, Harrison deceitfully changed the lyrics to, MY SWEET LORD, HARE KRISHNA!!! Harrison's 1971 song MY SWEET LORD, is a song of praise to the Hindu god, Krishna. In fact, Harrison admits that he did that to trick people. By that time the listener had already been mesmerized by the music and the song. George Harrison was an imposter who rejected Jesus Christ, and is burning in the fires of Hell forever because he died in his sins without Jesus Christ. I say this with sadness. 2nd Peter 3:9 declares that “God is not willing for any to perish” in their sins. CCM is leading the religious world into the New World Order. This is plainly evidenced by all the occult imagery on their album covers, and the Ecumenical Movement (i.e., let's unite by error, rather than divide over truth). CCM's true colors will come out IN THE END, when the Antichrist appears; just as George Harrison's song MY SWEET LORD, deceived millions of people to worship Hare Krishna of the Hindu religion. You are being deceived my friend. Yes, Contemporary Christian Music is beautiful. Third Day, Mercy Me and Tree63 sing some really pretty music, uplifting one's spirit. I am a musician, so I love all kinds of music, naturally. But as a Christian I have to side with THE TRUTH, and God's Word. I don't like being the bearer of bad news; but if the bad news is THE TRUTH, then so be it. The Gospel is two-thirds bad news... Jesus died and was buried. Those were very sad occasions to the Lord's friends, even though they knew it was necessary for redemption. So even though the Gospel is two-thirds bad news, we call it the “Gospel” (i.e., the good news) because it was all a good thing that the Lord was doing to redeem us. Amen! I've researched the CCM crowd and their music, and they're all rubbing shoulders with the sinful world. They're all using corrupt Bibles. They're all doctrinally compromised, prioritizing love and unity over truth and righteousness. They all sell their music for profit and the CCM industry rakes in billions-of-dollars annually. The lyrics are extremely vague and none of their websites tell anyone how to be saved to enter Heaven. It is self-evident that music will be a big part of Satan's New World Order. Just as millions of fans idolize their favorite Rock stars these days, so will the masses of society idolize and worship the Antichrist when he comes; who may very well be a Rock star, such as Bono from U2 (who is a member of the CFR and has worldwide influence). If 11,000,000 Americans will buy Marilyn Manson's garbage, then they'll certainly follow the Antichrist when he comes. Thus, you now know why Satan is using IMAGES. The purpose is the exact same reason that the Wizard of Oz constructed a giant fire-breathing Oz, bellowing out, “I AM THE GREAT OZ,” to intimidate people. Here is what the Bible teaches about Lucifer, the Devil... Isaiah 14:16, “They that see thee [Satan] shall narrowly look upon thee, and consider thee, saying, Is this the man that made the earth to tremble, that did shake kingdoms.” The all-seeing eye is bigger than life, and all the occult symbols around us; behind shoved in our faces, and down our throats... saying, We are the great architects of the New World Order, composed of Freemasons and other occult organizations, Luciferian worshippers, and you are our slaves!!! The All-Seeing Eye, Occult Images are Everywhere! Just as wicked king Nebuchadnezzar made an IMAGE for the people to bow to, so will the Devil make an IMAGE when the Antichrist comes, and kill those who refuse to bow (Revelation 13:15); just as Nebuchadnezzar ordered death to anyone who didn't bow to his golden IMAGE (Daniel 3:5-7). The New World Order will adhere to a Luciferian religion. Clearly, there is an occult connection between many false religions and Satan. You don’t have to believe it if you don’t want to, but the evidence is solid. As I mentioned earlier, Satan requires an allegiance. The photo to the right shows the CBS’ logo—the all-seeing eye. 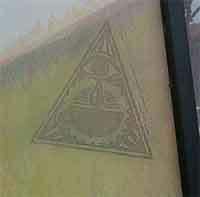 To the left, an illuminati eye is seen in a Starbuck’s window. Society is so infested with Satanism that few people even realize what is happening nowadays. 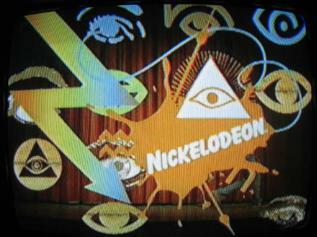 Below is an image from Nickelodeon…. These are symbols of the coming Beast system of the antichrist. This is why the apostate Israelites in the Wilderness demanded a golden calf, an IMAGE, to bow and worship. They needed an object of worship, something bigger than themselves. This is why the wicked men at Babel rose against God to build a Tower, a place, something bigger than themselves to unite them as one, but without God. The Antichrist will create an IMAGE, and demand that everyone worship it or die (Revelation 13:15). Why do world leaders and the who's who of top corporations and newsmedia meet at Bohemia Grove every July in California to worship a 40-foot owl? Again, we see an IMAGE. Images and symbols are critically important to occult and Luciferian Devil worship. Since it is not befitting for men to outright admit to worshipping Satan, then disguise their worship with IMAGES instead. The Illuminati have created a bigger-than-life feeling around the world with their Masonic pyramid and all-seeing eye. We see this in the “HOLLYWOOD” sign in West Hollywood. That sign generates a bigger-than-life feeling and atmosphere; just seeing the sign, because it appears in so many movies, and it has become a part of everyday life in the United States. Likewise, we are seeing the Masonic pyramid and all-seeing eye everywhere these days; they have become a part of our daily lives, embedded in our brains, and I sincerely believe that the Antichrist's IMAGE (Revelation 13:15) may be the all-seeing eye and The Great Pyramid (it is very interesting that The Great Pyramid, thought to have been built around 2,600 B.C., never had the capstone put into place). 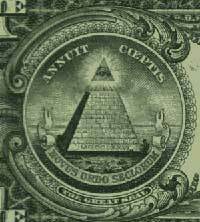 The Masonic pyramid on the back of every dollar has the capstone separated from the base. The capstone are the Illuminati, the architects of the New World Order, the occult elite. The fact that The Great Pyramid was built without a capstone indicates that the New World Order has been in the planning for millenniums. God segregated men at Babel, scattering people across the world, to safeguard humanity from corruption (Acts 17:26-27); Satan has been trying to undo what God did, and unite men against God ever since. Today, in God's permissive and sovereign will, Satan is uniting the world; breaking down language, cultural and denominational barriers, to unite men once again against God in a Luciferian worship (New Age). 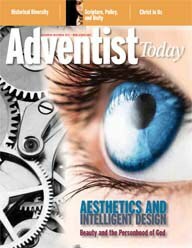 This is why apostate Contemporary Christian Music [CCM] singers, sinister ecumenical ministers, and the entire secular world, are all promoting unity in every form. This is why so many movies, like JUNGLE FEVER, featuring interracial marriage, have been used to corrupt America, breaking down cultural barriers. This is why the U.S. borders remain wide open, because without a border there is no country. The evil elite powers controlling everything from behind the scenes. 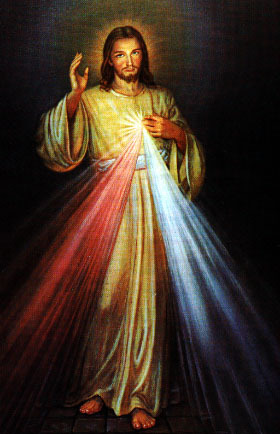 “In whom we have redemption through his blood, even the forgiveness of sins.” -Colossians 1:14If you’d like to know for sure, that if you died today you would go to Heaven, then simply believe upon Jesus Christ, who came to this earth as God Almighty in the flesh (John 1:1,14; Colossians 2:9), to die for your sins and mine. Simply ask Jesus to forgive your sins, and trust Him ALONE for your salvation. Adding anything to faith alone in Christ is NO faith at all (Ephesians 2:8,9). Won’t you trust Jesus now as your personal Savior? 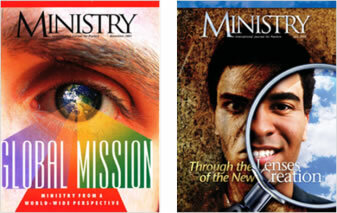 If you’d like more information about the truth, then please visit our website at www.Jesus-is-Savior.com. I understand that the truth often makes people angry, but the truth can be dealt with … a lie cannot. Who loves you more, the person who tells you the truth, even if it makes you mad? … or the liar who wants your money, and would never tell you what I just did? The Apostle Paul said, “Am I therefore become your enemy, because I tell you the truth?” We sell nothing on our website, or anywhere else. We do not accept donations. As God hath freely given us the truth, so do we freely give to others.